This beautifully renovated 3 bedroom home has a western water view of the 17th Island Green. 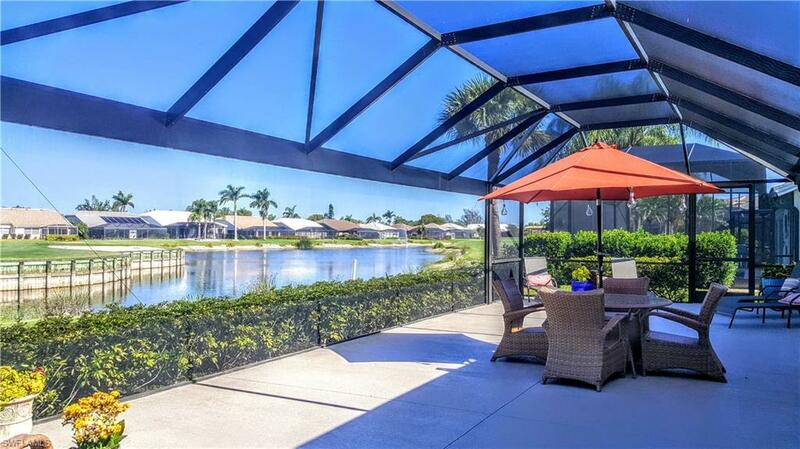 The large screened lanai and outdoor living area is perfect for enjoying the sunsets and wonderful FL weather. The 2 master suites have fully updated bathrooms and walk-in closets. The 3rd bath is also completely renovated. The updated kitchen has granite countertops, new backsplashes & reverse osmosis faucets. Both the Stainless Steel oven and microwave are built in, with a separate cooktop. The kitchen has a breakfast bar & dinette area. This space opens up to a large outdoor living space ideal for relaxing, entertaining & enjoying the FL weather. With aa expanded 2 car garage you will have plenty of room for a golf cart as well as your vehicles. Lots of storage in this well planned home. Community amenities include golf, restaurant, bar & grill room, tennis & pickleball courts, large fitness center, pool/spa & many social activities. Furnishings are negotiable. Olde Hickory Golf & Country Club is recognized as 1 of the best bundled golf communities in SW FL. You can golf 3-4 times a week in season in this low density community.